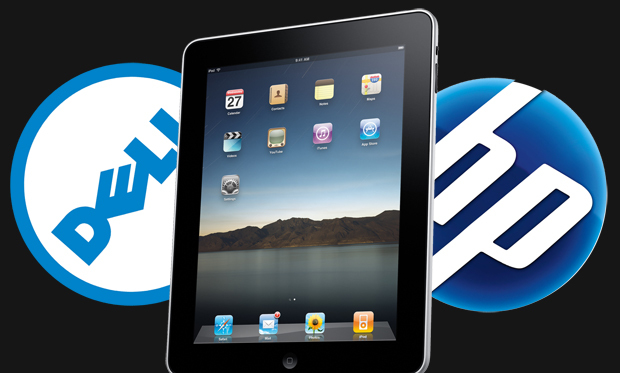 Will the iPad Blast Apple’s PC Market Share Past HP and Dell? 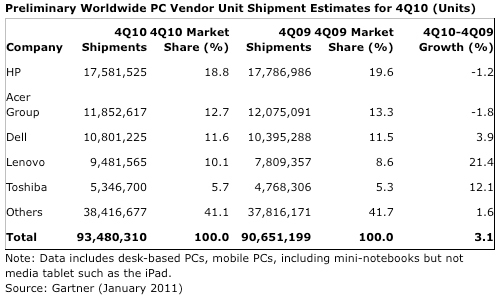 You may be surprised to find that in the PC market, Apple isn’t even in the top 4 in the US, nor top 5 worlwide. How come it can’t catch up to HP and Dell–not to mention Acer, Lenovo, and Toshiba? Consumers hear but a few names in the gadget game: Apple, Apple, and Apple. Steve Jobs can release any new MacBook, iPod, iPhone, or even a shiny touchscreen toaster, and sales will shoot through the roof, riding the coattails of its devoted following and millions of dollars in free press. Yet many are surprised to find that in the PC market–desktops, laptops, netbooks, etc.–Apple isn’t even in the top 4 in the US, nor top 5 worlwide. Doesn’t Apple sell millions of devices with every product release? How come it can’t catch up to HP and Dell–not to mention Acer, Lenovo, and Toshiba? Though you probably can’t name a single product in these companies’ portfolios (whereas you can likely name name every Apple device going back to the late ’90s), Apple still trails in market share. According to a report out this week from Gartner and IDC, Apple holds just a 9.7% share in the US, compared with close to 30% for HP and 22% for Dell. On a global scale, Apple isn’t even listed, with its closest competitor Toshiba at around 5%. “Apple has a very different position in the market–people don’t mind spending a premium to buy Macs, which are still very much more expensive than Windows-based systems,” says lead Gartner analyst Mikako Kitagawa. Still, despite its low market share, Apple is blossoming, growing 23% year-over-year in the last quarter, compared with big drops from its top three competitors. “Apple had a great increase in its PC market–it has very good traction because of the iPad, iPhone, and iPod,” Kitagawa says. Traction is right. The iPad blasted off this year with 10 million units sold, becoming the fast-selling electronic device in history. Unfortunately, Gartner’s analysis does not include tablets in the PC market–only devices running Windows and Mac OS, rather than iOS, Android, or other mobile platforms. 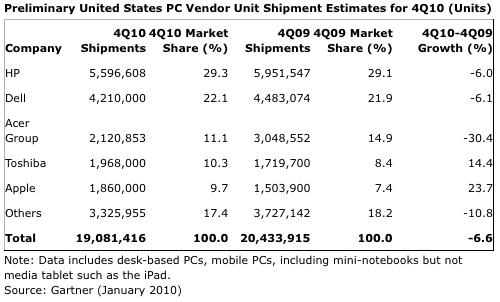 Wouldn’t including tablets significantly increase Apple’s market share? You can only stay on top for so long, HP and Dell.